As low as $69.99 per coin over spot! The South African Gold Krugerrand coin is available annually in four weights. The primary option is the 1 oz coin available since 1967. There are also three fractional weights that were introduced in 1980. The largest of these three weights is the 1/2 oz South African Gold Krugerrand. Right now, the 2019 1/2 oz South African Gold Krugerrand Coin is available to purchase online from JM Bullion. Arrives inside of protective individual packages or mint tubes of 15 coins! 53rd issue of Gold Krugerrands from the South African Mint! Contains 1 Troy oz of actual gold content. The obverse includes the image of Paul Kruger. On the reverse is the design of the Springbok antelope. Each 2019 1/2 oz South African Gold Krugerrand Coins in this listing comes to you in Brilliant Uncirculated condition. The individual coins you purchase arrive in protective packaging while multiples of 15 are offered inside of mint tubes of 15 coins per tube. The fractional-weight coins are available for the 40th time since their introduction in 1980. The South African Gold Krugerrand dominated the gold bullion coin market for nearly 20 years. More than 50 million ounces of Gold Krugerrands have been sold since 1967, with the Gold Krugerrand reaching its peak in the mid- and late-1970s as a bull market for gold pushed demand higher despite a Western boycott on South African goods. On the obverse side of 2019 1/2 oz South African Gold Krugerrands is the image of Paul Kruger. This left-profile portrait captures the image of the South African Republic’s first elected president and features his iconic beard in the design. This side of the coin includes the name of the nation of issue in both English and Afrikaans. 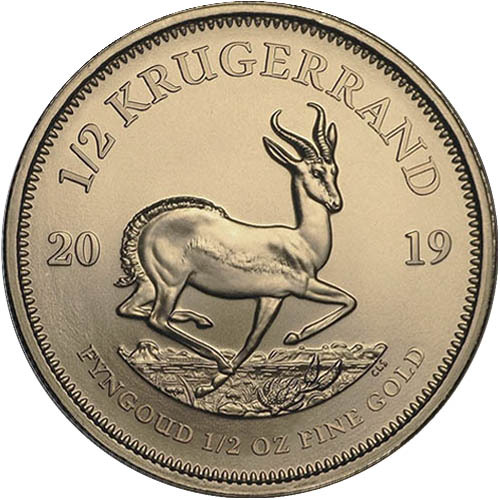 The reverse of 2019 South African Gold Krugerrand Coins includes the design of a Springbok antelope. The antelope is commonly found throughout the nations of southern Africa, including the nation of South Africa. The Springbok is the official symbol of South Africa and engravings on this face of the coin include the name of the series, the year of issue, and the coin’s weight, metal content, and purity. The South African Mint is a private corporation that works with the South African Reserve Bank to issue coins for the nation. Along with the Rand Refinery, the South African Mint strikes and releases the Gold Krugerrand coinage and its newly introduced Silver Krugerrand option as well. If you have any questions about these gold coins for sale, please feel free to reach out to JM Bullion. You can call us at 800-276-6508, chat with us live online, or send us an email.